Estate Agents in Fitzrovia often refer to the area as having a metropolitan feel with a bohemian history. This unique area has so much to offer its residents and Davis Brown have put together a guide with all you need to know. Fitzrovia is surrounded by Marylebone, Soho and Bloomsbury and sits partly in the City of Westminster and partly in the London Borough of Camden. It covers the area between Euston Road,Oxford Street, Tottenham Court Road and Great Portland Street. 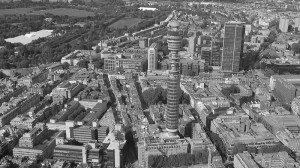 Landmarks include the Grade I listed Fitzroy Square, as well as the sky scraping BT Tower. It is thought the term Fitzrovia dates back to the 1930’s and takes its name from the Fitzroy Tavern, a small public house on the corner of Charlotte Street that became the epicentre of the local community. Previously the area was seen as an extension of the West End, however as artists and writers flocked to the area, Fitzrovia took on an identity of its own. Famous residents such as George Bernard-Shaw, Virginia Woolf, John Constable and George Orwell helped establish the area as a bohemian, creative hub. However it was not until 1994 that ‘Fitzrovia’ appeared on Ordnance Survey maps and the area was officially recognised. Today, Fitzrovia has over 6,500 residents and is workplace to over 50,000. Fitzrovia has been home to Davis Brown Estate Agents since the early 1900’s, and it is one of the longest established independent Estate Agents and Chartered Surveyors in the area. There are five tube stations within Fitzrovia – Oxford Circus, Tottenham Court Road, Goodge Street, Warren Street and Great Portland Street with access to the Northern, Victoria, Central, Circle, Metropolitan and Hammersmith and City lines. Cross rail, due to be fully operational in 2018 will also serve the area, stopping at Tottenham Court Road. All stations are located within zone 1 with an annual travel card costing £1,284. Fitzrovia offers a wealth of different activities and things to do from a trip to Pollock’s Toy Museum or the BBC, to a wander round the Getty Gallery which regularly puts on different exhibitions of its famous photographs. After you could try the Mad Hatter’s Afternoon tea at the Sanderson Hotel (prices from £48 per person) or test your knowledge with a pub quiz at The Albany (240 Great Portland street every Tuesday evening). Whether you are looking for a light lunch or a blow-out dinner, Fiztrovia has plenty on offer. Brunch at the ever popular Riding House Café on Great Titchfield Street provides a fantastic start to any day. Father and son venture Kin on Foley Street is a delicious vegetarian option for lunch time and customers can either eat in or take away. For something a little more exotic, head to Lima in Rathbone Place – this was the first Peruvian restaurant to be awarded Michelin status and it won’t disappoint. For your daily dose of coffee head to Kaffeine on Eastcastle Street or for those of you cocktail lovers, take a pew at The Reverend JW Simpson on Goodge Street. Fitzrovia has so much to offer its residents, from excellent schools to picturesque parks. For those of you looking to bring up a family Fitzrovia has several state and private schools, including a bilingual French school. Fitzrovia also has a variety of parks and open spaces – Regents Park and Queen Mary’s Gardens are a short walk and serve as a haven for cyclists and walkers alike. All Souls Church Langham Place is a fantastic spot to watch watch the world go by. If you are looking for some culture, seek out the blue plaques dotted around the streets which feature snippets of local history and information. Property in Fitzrovia is a diverse mixture of old and new. Roads such as the desirable Goodge Place are characterised by Georgian townhouses, however more modern developments such as the much talked about Fitzroy Place offer modernity and luxury. From the Grand Grade I Listed Fitzroy Square to the large sixties council development Holcroft Court on Clipstone Street, property prices are inclined to vary hugely. However, I think that most agents will agree that there is some uncertainty in the property market with the run up to the general election. The Royal Institution of Chartered Surveyors (RICS) published a report in February 2015 which stated that Chartered Surveyors in London have reported falling residential property prices which is no surprise with a potential ‘mansion tax’, the recent reform on stamp duty and the ‘envelope’ tax. Historically, it is widely known that property transactions are often lower before a general election; however the RICS reports that on average respondents expect to see prices rise by 2.4% over the coming year and by an average of 4.5% per annum over the course of the next 5 years. As the old adage goes – buy low, sell high. These might be challenging times but perhaps a market we should consider embracing? For more information about properties in Fitzrovia, please Contact us today and speak to Emma our Residential Manager, or Sarah-Jane our Residential Negotiator.